Elongated along the Himalayas, Nepal is a landlocked country with a total land area 147,181 Sq./Km. (56,136 Sq/M). The country is bordered by the People's Republic of China to the North and the Republic of India to the South, East and West. Its topography varies from the high snow-clad peaks and the mid mountain region with fertile valleys to the southern plains known as Terai, so is the climate ranging from the alpine in the north to hot & humid in the southern plains. World's highest peak Mt. 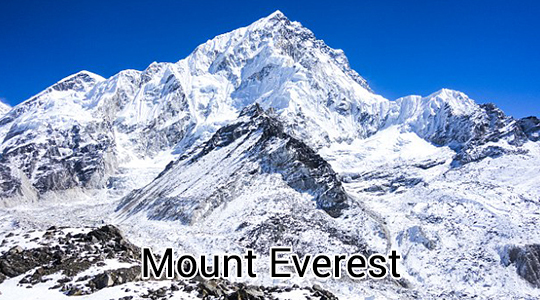 Everest (Sagarmatha), 8,848 meters (29028ft.) lies in Nepal. Its capital, Kathmandu, is a valley with pleasant climate. Nepal is a country of diversity and ambiguity with amazing landscapes and populace. It is known for its mountain ranges and the historically significant religious sites. The influential architectural genius of the past brings alive the culture of Nepal. Thousands of temples and shrines still survive amidst the modern changes. Nepal has stood the test of time in the history and still stands tall as a nation of peace, love and harmony. The people of this country have diverse religious and ethnic backgrounds yet blended perfectly as one community. Varies from cool summers & severe winters in north to subtropical summers and mild winters in south. Quartz, Water, Timber, Hydropower, Scenic Beauty, Small Deposits of Lignite, Copper, Cobalt, Iron ore. The geography of Nepal is blessed with a number of small and large rivers. Three main river systems - Kosi, Gandaki and Karnali originate in the Himalayas, flow southward and empty into the Ganges. Nepal has been a habitat of different rare species of flora and fauna. In order to protect the fragile eco-system, Nepal has set up thirteen national parks and wildlife reserves in different parts of the country. The Nepalese people have always been preferred to other societies for their simplicity and their prowess for diligent working abilities. They have proved their efficiency in protecting many countries and building great cities. There are numerous cultural and religious festivities celebrated round the year which makes it a land of joy and celebration. Nepal has its own distinction in becoming the ideal tourist destination of the world perhaps because Nepal is special in every aspect.